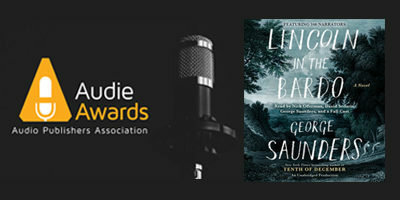 Penguin Random House Audio won the top prize – Audiobook of the Year – for George Saunders’ LINCOLN IN THE BARDO (Random House Audio) last night at the 23nd annual Audie Awards® in New York. 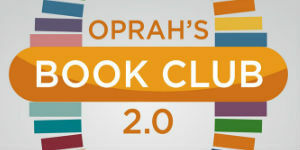 The Audio Publishers Association (APA) annually presents the premier awards program for audiobooks in the United States, recognizing excellence in audiobooks and spoken word entertainment. LINCOLN IN THE BARDO, narrated by Saunders, Nick Offerman, David Sedaris, and 163 other voices, was produced by Senior Exectuive Producer Kelly Gildea, who accepted the award on stage along with Amanda D’Acierno, Senior Vice President and Publisher, Dan Zitt,Vice President of Content Production, other Penguin Random House Audio team members, and several narrators.. On Wednesday, LINCOLN IN THE BARDO received the Indies Choice Audiobook of the Award at the Celebration of Bookselling & Author Awards Luncheon at BookExpo. 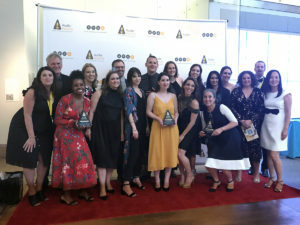 Big congrats to the authors, narrators, producers, marketers and the entire award-winning PRH Audio team.In addition, Penguin Random House Audio won an Excellence in Marketing Audie Award for “Transform Your Commute,” the NYC campaign that encouraged listeners to turn a sour commute sweet with audiobooks. 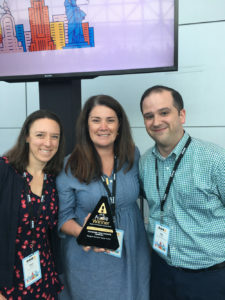 Pictured at the Audies are several members of the marketing team who created the initiative (left to right) Vicki Tomao, Heather Dalton, and Rob Guzman. 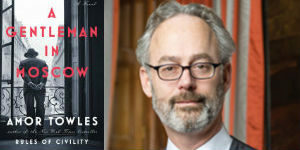 To view the complete list of Audie Awards winners, click here.